I personally don't see STV-DTW coming before STV-EWR. DTW would need a flight from DEL or HYD first. IndiGo launches direct lights from HYD and VNS to BKK wef 15DEC18 on a HYD-BKK-VNS-BKK-HYD rotation. With these, IndiGo flies to BKK from 5 Indian airports. I just called up Air Canada call centre . They said that the flight (YYZ BOM) will become seasonal so it will run only during winter. Goair to commence 3x weekly BLR-HKT (Mo, Fri & Sun) & 2x weekly BLR-MLE (Wed, Su) wef 09/12/18. Bookings are now open. It seems MLE and HKT flights seem to be launched only from the big 3 private airports, BLR, BOM and DEL (and COK), whereas MAA, which is much closer to HKT, is cold-shouldered. Why? HKT will be served from a total of 10 Indian cities in the coming year by GoAir. HKT will be a 'Base' for the airline and soon will begin DMK/BKK ops in 2019. So if im not wrong they will begin flights from MAA in 2019 for sure alomg with other cities in 2019. I've also heard they may tie up or do skme type of interlink/codeshare with an Int'l airline. FAA team has expressed satisfaction over India's safety preparedness and Category 1 rating is expected for India, reports Arindam Majumder of Business Standard. Amreekan resident doomsday predictors can rest easy. Some crying on here over network-mirroring by market leader. Also, article states SG has shutdown three stations including Agartala. Which are the other two? Goalless capacity dumping and price lowering(I am going to use an acronym CDPL going forward) are not winning strategy, sure some competition may fold but will never achieve the monopoly as intended, the rot starts within. Emirates is the perfect example. Indian financial analysts were little late in questioning Indigo's strategy. Indian aviation analysts are clueless, still thinking AI or 9W going out of business in the solution. I always thought why MoCA/DGCA didn't intervene, then I realized mansions in posh Delhi areas won't get built on a government salary. Competition will be there, aggressively. So Mr Kapoor can just earn sympathy and nothing else by whining about network mirroring and tweeting about the same. And about SG, ask them can they even operate well with proper competition and without Mr Ajay Singh . 9W and AI have faced all these but never complained. You can’t blame your competitors for their economies of scale and operational advantages. Having said that, this might be an attempt to encourage consumers to raise this issue. The Tripura CM came on record about Indigo jacking capacity, driving out SG and jacking up fares. If this method can be proven for a few other routes, the competition authorities may have something to say. Ajay Singh has Modi's ear, so him whining gets attention in right places. One more thing Ajay Singh should bring to Modi's attention. A rupee earner is burning forex at an alarming rate depleting India's forex reserves. In this case, unnecessary capacity dumping by wasting forex on leases, MX and ATF is not good for India's economy. Domestic connectivity drastically improving must be real bad for the economy. Is there information on why Lufthansa has replaced LH764/765 with LH766/767? One more thing Ajay Singh should bring to Modi's attention. What Singh need to bring to Modi's attention is the precarious position it (will) find itself in and that the entire industry is in, and hence the need to bring about some reforms in the policy and taxation in the industry. Will the debt relief help ? And for the 'it's all hot money/slush money/tax have money' crowd, this figure comes from audited balance sheets. If they doubt that they should probably ask India's master of frivolous law suits - Prashant Bhushan - to file a case at the NCLT. 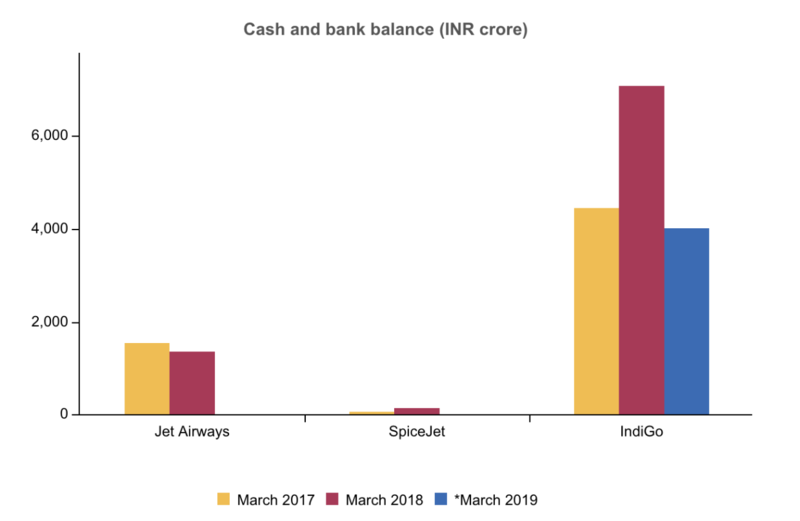 I know that companies like to use creative accounting techniques, but I don’t see how Indigo have obtained an “audited balance sheet” for “March 2019” when it is now November 2018. The 1st 9W BOM-MAN service landed just under an hour early today. Understood - I wondered if I’d missed anything! In other news, Ural Airlines is launching daily service between DME and BOM. This is a big win, though I wonder how prosperous this route will be considering it's 7+ hours on a narrowbody. Eugh. This is mainly to attract tourist traffic as getting to Moscow via LHR /CDG may not be preferable to many, only preferable option remains ME3 . So I think Ural has done the right thing. Now only if they get an Indian partner. DEL/BOM-Russia is largely unserved. This is a bold move from U6, as it is now the second airline (after SU) between India and Russia, as AI discontinued DEL-DME flights. Now if only a DEL-LED flight took place! However, other CIS countries have plenty of service to India, with KC on TSE/ALA-DEL (BOM is on the horizon), HY on TAS-DEL, ZM (Air Manas) on FRU-DEL and T5 on ASB-ATQ and others. BTW, I don't know why T5 flies ASB-ATQ! Any reason? Russia-India is quite underserved, but considering U6's fares on the nonstop (INR 65K usually), they aren't very competitive or compelling. One could easily fly the ME3 (with widebodies on EK) or EU carriers (NB for <4 hours) for much cheaper. The only advantage is the nonstop, really. Maybe that will stimulate demand or work well for business people. The good thing about the flight are the timings IMO (landing in DME, departure is hellish). HY recently launched TAS-BOM, and I think T5 also operates ASB-DEL. As for ASB-ATQ, I also have no idea. T5's ASB-ATQ is primarily used to feed their flights to London Heathrow and Birmingham. Always some of the cheapest fares around. SG has no cash, ouch! Only people who survive this industry in down cycle are the ones with money in bank or Air India. IndiGo outlines ambitions for China market. IndiGo chief strategy officer Willy Boulter said the carrier is "very ambitious for the Chinese market", airlines currently operate 42 weekly frequencies between the countries while Indian airlines only operate five. IndiGo is currently evaluating the feasibility, with Kunming one of the cities under consideration by the airline. China’s Big Data hub looks at direct air link with India’s Silicon Valley, Bengaluru. Now let's see what kind of slots they are given . China has a record of not offering proper slots to Indian carriers . I read this in an article few hrs back that they have cut COK & IXE-DXB city pairs because of these new flights. Interesting that they r conc on BOM/DEL hubs. Will be interesting to see what they will do with launch to say PEK/PVG in 2019/20. Lets see... what will happen. Maybe this time China knows that to increase bilateral between the two countries is only possible if it's fully utilised from both sides. Earlier India was generous on that front and never cared for the Indian side of it. But now they do. And China is desperate for more access to India's aviation market. So they may be kinder this time on slot timings. Also, 6E strategy here is typical. Limited frequency to China, so utilise quickly before rivals start expanding and spare no chance for them here ( read China). Whatever is limited, gobble it up quickly. Thats the way they did it for DXB. And SG has signalled interest many a times on China too, so one way of keeping them off. Does anyone know if the Air India Mumbai ground staff strike is a one-off issue, or is it likely to spread countrywide? Reports indicate 37+ flights delayed at BOM, with different sources providing a variety of numbers. It seems BLR is a prime candidate for launching new routes to China, given that 6E has already gone ahead with BLR-HKG, and 9W was looking at BLR-PVG. @sand26931, can you shed any more light on this? For a time, SG flew to CAN. Did that route fail because of the SG financial crisis, or low demand? I am not aware of this development wrt 6E China expansions (for now), acc to the CAPA article 6E is still "evaluating feasibility" on mainland China. So it would be a bit early to comment on this. I wud bet on DEL/BLR/ BOM(Probably) and even perhaps CCU (to Kunming perhaps). AFAIK the next part of their intl expansion is Saudi, partly EU and Vietnam/Indonesia. Regarding a potential Chinese carrier to BLR in 2019, I am not aware of it as of now. But PVG was #7 in the TOP unserved destination from BLR in 2017-18, so there is demand and potential. But it depends on the bilaterals and other stuffs. IndiGo has updated its website with a fresh new look, same with the app. Any latest news on opening up of HAL airport in Bangalore city for commercial operations? The last I checked, talks were on between state government, BIAL and HAL. All parties were reported as being keen on this. If this materializes before the end of 2019, Bangalore will be the first major city in India to have 2 operational commercial airports. Though the article doesn't specify a timeline, I'm hoping for this to happen soon and for them to move short haul domestic traffic to HAL airport. I'm sure the ones who've suffered the city's infamous traffic and lack of infrastructure would totally support this. HAL airport has the potential to become Bangalore's equivalent of LCY - a small airport closer to city centre complementing a much larger airport away from the city. I think BIAL will have the first right of refusal for running the airport if this plan materialises. Meanwhile the cabinet has approved the privatisation of 6 airports - AMD, JAI, LKO, GAU, TRV and IXE. Cue the likes of Prashant Bhushan running like headless chicken screaming SCAAMMMM! Once again MAA and CCU miss the bus. Yet they were the forerunners for privatisation. For MAA this is just too bad. The international terminal is straight from the 1980s. Any idea from when these 125 will be heading to India? The 1st 321N will be arriving this month acc to reports. That's interesting. I wonder if we might finally see them expand in Europe and Africa with these aircraft. I'm surprised this didn't happen earlier. They need to cut unit costs and the A321 is the easy way to do so. I'm a skeptic on the widebody order. First use NEO range to open up say China.